Absolut is a brand of vodka produced in Sweden and owned by the French group Pernod Ricard. It is currently the third largest alcoholic spirits company in the world after Bacardi and Smirnoff. As with most vodkas, it comes in many different flavors including citrus, mandarin, raspberry, peach, mango, and many more. Absolut was originally founded in 1879 by Lars Olson Smith, who invented a way to produce the liquor using the fractional distillation method called Tenfold Purified Vodka. The Absolut vodka is made from winter wheat ingredient. In 2008, 96 million liters were produced and sold worldwide. Below are the latest Absolut prices. 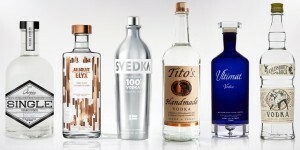 As with most vodka mixed drinks, you can usually swap out one brand name for another. In case you have some Absolut vodka in hand and want to make some tasty drinks with it, then follow some of the recipes below. Absolut Splash – 1 ½ oz. Absolut vodka and 1 ½ cups V8 vegetable juice. Arizona Stingers – 2 shots Absolut vodka and 12 oz. iced tea with lemon. Bird Bomb – 3 oz. Absolut vodka, 1 oz. DeKuyper Cheri-Beri Pucker schnapps, and 8 oz. lemonade. Bloody Hell – 4 ½ oz. Absolut vodka, 6 oz. V8 vegetable juice, 3 dashes Hot Sauce, 8 dashes Worcestershire sauce, 2 pinches salt, and 2 pinches of pepper. Buzz Lightyear – 2 oz. Absolut vodka, 2 oz. Midori melon liqueur, and 3 oz. fresh orange juice. Diva – 1 ½ oz. Absolut vodka, ½ oz. passion-fruit juice, ½ oz. lime juice, 1 tablespoon cherry juice, and 7-Up soda. John Rocker – 2 oz. Absolut vodka, 1 ½ oz. peach schnapps, and 4 ½ oz. grape juice. Magic Punch – 4 oz. Absolut vodka, 1 oz. guava juice, 1 oz. papaya juice, and 1 oz. mango juice. Missle Pop – 2 ½ oz. Absolut vodka, 2 splashes pineapple juice, 3 splashes fruit punch, and orange juice. Pimp Cocktail – 2 oz. Absolut vodka, 1 oz. Blue Curacao liqueur, 1 oz. peach schnapps, and 5 oz. Sunny Delight orange juice. Red Rock – 1 ½ shots Absolut vodka, ¾ shot wildberry schnapps, and 1 can Dr. Pepper soda. A Fuzzy Thing – 2 oz. Absolut Citron vodka, 1 oz. triple sec, 1 ½ oz. peach schnapps, 1 splash orange juice, 1 splash pineapple juice, and sweet and sour mix. Absolute Lemonade – 1 oz. Absolut Citron vodka, 1 oz. amaretto almond liqueur, 2 oz. sweet and sour mix, and Sprite soda. Absolut Limousine – 2 oz. Absolut Citron vodka, 1 oz. lime juice, ice, and tonic water. Citronade – 3 shots Absolut Citron vodka and 8 oz. lemonade. Lava Lamp – 2 oz. Absolut Citron vodka, 6 oz. apple juice, and 3 ml. granadine syrup. Triple Threat – 1 oz. Absolut Citron vodka, 2 oz. triple sec, 1 oz. peach schnapps, 1 ½ oz. Minute Maid orange juice, and ½ oz. 7-Up soda. Absolute Heaven – 1 ½ oz. Absolut Mandarin vodka, pineapple juice, 1 splash cranberry juice, and ice. Blue Screw – 1 ½ oz. Absolut Mandarin vodka, 1 oz. Blue Curacao liqueur, and orange juice. Chocolate Orange – 1 ½ oz. Absolut Mandarin vodka and 1 ½ oz. white crème de cacao. Mandarin Crush – 1 oz. Absolut Mandarin vodka and orange soda.